After Round 2 of the PBR World Finals, No. 1 Kaique Pacheco and No. 2 Jose Vitor Leme have still yet to buck off. Photos: Andy Watson/BullStockMedia.com. LAS VEGAS, Nevada – As the final two men to erupt from the chutes inside T-Mobile Arena for Round 2 of the 25th PBR: Unleash The Beast World Finals, the top two contenders to be crowned the 2018 PBR (Professional Bull Riders) World Champion, No. 1 Kaique Pacheco (Itatiba, Brazil) and No. 2 Jose Vitor Leme (Ribas do Rio Pardo, Brazil), continued their flawless performances in Sin City, fueling yet another intense race for the $1 million bonus and coveted gold buckle. Continuing to ride with painful tears to both the MCL and PCL in his left knee, Pacheco inched one step closer to his first world title with an extraordinarily gutsy performance in covering Smooth Wreck (Owens/Wyatt/Smith) for 88.75 points to finish fifth in the second round. His Thursday night ride earned him $6,000 and 75 world points. “I just try to clear my mind, focus on each bull, and get it done,” Pacheco said through a translator. Leme recorded his second 8-second effort of the event aboard Bad Beagle (Phenom Genetics/Rothe), marked 91 points to finish second in Round 2, earn 180 world points, and now leads the event. 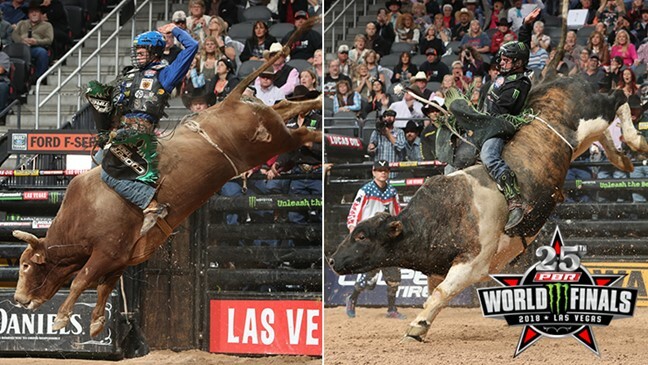 The match-up was a familiar one for Leme, as he has attempted the bull three previous times. He has now evened the record against the bovine athlete, having covered him for 91.5 points during the championship round of the March elite tour event in Albuquerque, New Mexico. The 22-year-old phenom has now gone 8-for-8 at the most prestigious event in bull riding, a streak which dates back to last season’s event where he went 6-for-6 to capture the 2017 World Finals event win. Of the 8 qualified rides, four have been for 90 points or more. Leme earned a check for $20,000. In the world standings, Pacheco began the round 1,452.5 points ahead of Leme. He enters Round 3 with a slightly smaller lead, now 1,347.5 points ahead of his countryman. After the bulls dominated the first 19 outs of the evening, Marco Eguchi (Poá, Brazil) brought the crowd inside T-Mobile Arena to its feet, erupting for the high-marked ride of his career en route to winning Round 2 of the 2018 PBR World Finals. The 29-year-old was marked 94 points on Spotted Demon (Julio Moreno/Dallas Schott) to earn $35,000 and 300 world points. The matchup was a familiar one; Eguchi bucked off the bovine athlete just short of the 8-second mark at the final regular-season elite tour event in Nampa, Idaho. This time he made the whistle in spectacular fashion, but was then immediately slammed by Spotted Demon and laid on the dirt several minutes before being escorted off by Sports Medicine. Eguchi is now 2-for-2 in Sin City, and tied for second in the event, after riding Velocity (Andrews Rodeo Co. Inc.) for 85.5 points in the opening round. That ride, tied for the 14th highest score at the PBR World Finals, elevated Eguchi three positions in the world standings. He is now No. 17 after beginning the round No. 20. Recording the third 90-point effort of the event, J.B. Mauney (Statesville, North Carolina) rode M.A.G.A. (TNT Bucking Bulls/Hart Cattle Co.) for 90.5 points to finish third in Round 2. The 8-second effort is the two-time World Champion’s 517th on the elite tour, the third most of any rider in PBR history. Earning $15,000 and 125 points, Mauney rose from No. 33 to No. 28 in the world rankings. Delivering his high-marked ride of the season, Paulo Lima (Bezerros, Brazil) covered Southern Style (EVP Bucking Bulls) for 89.5 points to finish fourth in the round. Lima advanced to the World Finals as one of the top-two finishers from the Velocity Tour Finals not already ranked inside the Top 35. He collected $10,000 and 95 points for the 8-second effort, rising to No. 44 in the world rankings. In the overall event standings, Eduardo Aparecido (Gouvelândia, Brazil), Guilherme Marchi (Três Lagoas, Brazil) and Chase Outlaw (Hamburg, Arkansas) also covered their second round draws to round out the contingent of six riders to be 2-for-2 at the most prestigious event in bull riding. Aparecido was sixth in the round, earning $3,000 and 50 world points, after riding Blue Stone (Dakota Rodeo/Chad Berger/Clay Struve) for 87 points. Marking his 634th career ride on the premier series, the most of any rider in league history, 2008 World Champion Marchi covered Crazy Days (Dakota Rodeo/Chad Berger/Clay Struve/Heald Pro Bulls) for 86.75 points to end the round seventh, netting $1,000 and 35 points. Rising one spot in the world rankings, Outlaw’s 85-point trip on More Big Bucks (Dakota Rodeo/Chad Berger/Clay Struve/Staci Wilks/N Bar Ranch), the seventh best score of the round, earned him 25 world points. Round 2 of the event also featured the first trip for the bulls contending for this season’s YETI World Champion Bull title. Current No. 1 contender SweetPro’s Bruiser (D&H Cattle Co./Buck Cattle Co.), the two-time and reigning World Champion Bull, earned a 44.75-point bull score for his 3.35-second buckoff of Francisco Garcia Torres (Saltillo, Mexico). The out allowed No. 2 bull Smooth Operator (Dakota Rodeo/Julie Rosen/Clay Struve/Chad Berger) to narrow the gap in the standings, after his 6.2-second trip with Fabiano Vieira (Perola, Brazil) earned him a 45.5-point bull score. The two bovine athletes are now separated by 0.5 points after Bruiser entered the round 0.65 points in front. For his out with Eguchi, Spotted Demon, who earned a 45.75-point bull score, established himself as a bull to note. He now trails Bruiser by 0.97 points in the world average. The 2018 PBR World Finals will continue with Round 3 tomorrow with action beginning at 7:40 p.m. PT. CBS Sports Network will televise the action LIVE beginning at 7:30 p.m. PT, accompanied by RidePass’ listen LIVE stream starting at 7:10 p.m. PT.